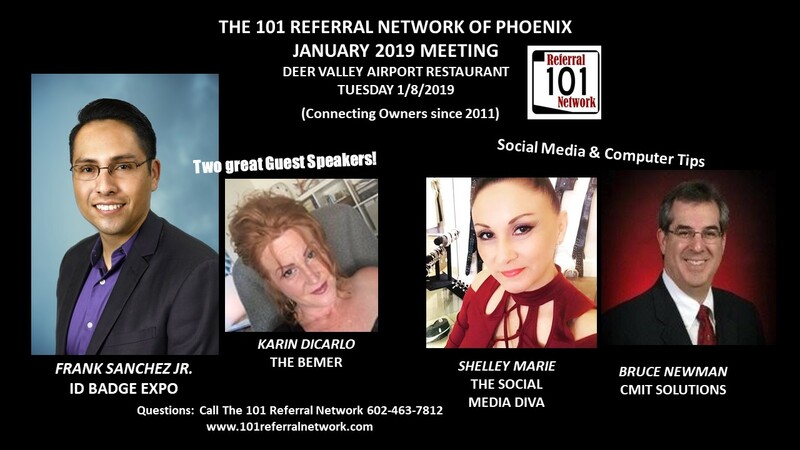 We’re back to business this Tuesday January 8th,2019 nth The 101 Referral Network of Phoenix where you will grow your referrals! Present your business and let our Members and Guests learn about your products and services. We are non-industry specific and welcome local business owners that want to grow their referrals. Learn about the businesses of Guest Speakers and newest Members Fausto Sanchez Jr. and Karin DiCarlo-McBride. Learn some Social Media Nuggets provided to our attendees by Shelley Marie of Shelley Marie SMD – The Social Media Diva.